After six months in a non-engineering role with Boeing, and thanks to an engineering degree from Washington State University, Jaimie Nguyen landed the engineering job at Boeing that she really wanted. She chose to work toward a career in engineering just a few years after her family moved to the United States from Nha Trang, Vietnam in 2009. For her, the Voiland College of Engineering and Architecture’s program at WSU Everett was a perfect fit. “I chose mechanical engineering because it is such a broad degree, and I enjoyed working on robotics,” she said. Today, her career has taken flight at Boeing, where she converts 777X models as a process engineering/web developer. “My group manages a system that takes models drawn using CATIA software and converts them into a three-dimensional PDF file so our clients can view them,” she said. Nguyen graduated from Edmonds Community College in 2014. She then started an internship at Keltia Design Inc. in Everett where she taught SolidWorks and CATIA training courses to people seeking employment or retraining. For two years, Nguyen taught individuals with experience in two-dimensional modeling how to work with modern, three-dimensional modeling software. Before the adoption of three-dimensional modeling, aerospace companies like Boeing used two-dimensional representations, and drawings, to communicate design plans. As technology has advanced, these individuals have had to seek retraining to learn new skills to work with new software. “I was happy when I found out Boeing wanted to hire me, and I really think that my internship is what made me stand out,” she said. 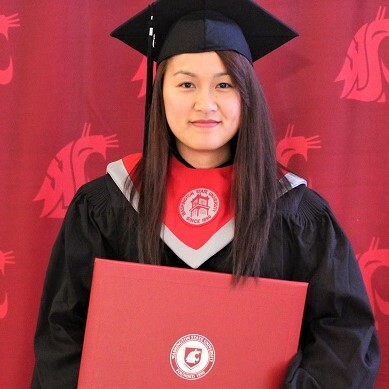 Nguyen was hired by Boeing in January 2016 as a product data management specialist while she finished her degree at WSU Everett. In that role, she built three-dimensional annotation airplane grid zones and CATIA models for visualization testing. After graduating from WSU in spring 2016, Nguyen applied to a new position at Boeing that required a four-year degree, and she was hired. Like many students at WSU Everett, Nguyen had to balance family, work and her studies. But, since she had already started at Boeing, the challenge was even greater. With the ability to stay close to her family, she also appreciated the more intimate classroom environments found in programs at Everett. “My family is here and I need to support my parents. Working and studying here in Everett was easier than it would have been in Pullman or Seattle,” Nguyen said. Equipped with incredible local experience and a Washington State University mechanical engineering degree, the sky is the limit. Learn more about WSU Everett Mechanical Engineering or apply here.